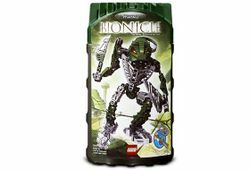 8740 Toa Hordika Matau is a BIONICLE set released in 2005. He is a Toa Hordika. He has two Fang Blades as weapons and a Rhotuka Spinner with a Launcher on his back. In the BIONICLE universe, he was the Toa Metru of Air, but later was mutated into a Toa Hordika. He eventually became a Turaga. This is a description taken from LEGO.com. Please do not modify it. (see an archive of the product's page) Raging cyclone unleashed! Pulling the ripcord out of the launcher quickly will launch the spinner. Facts about "8740 Toa Hordika Matau"